Blend arugula, spinach, and water until smooth. And the juice from one small lemon (about two tablespoons) and apples(cored and chopped). Blend until smooth. Tip: if you like your smoothies on the sweeter side use two apples. 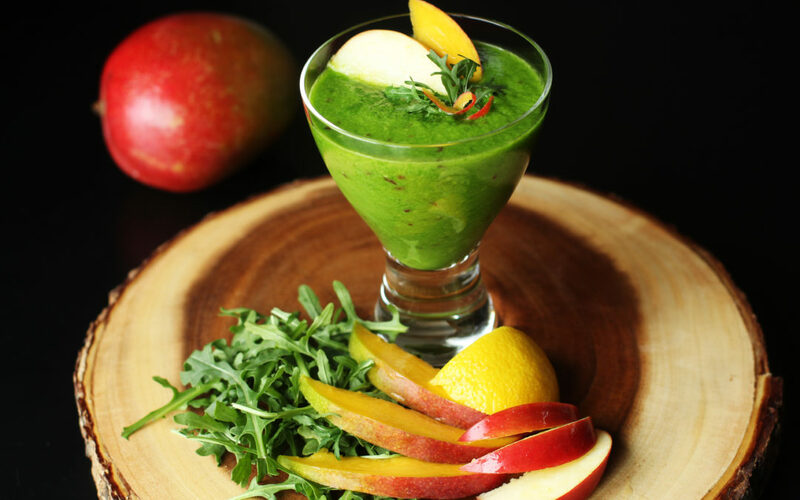 If you prefer agreener tasting smoothie (*raises hand) use just one apple + only 3/4 cup water. Next add frozen mangos and blend until smooth. If needed, add more wateruntil you reach the desired consistency. Pour smoothie mixture into 8 or 12 oz. canning jars + put the lid on andrefrigerate. Congratulations! You now have smoothies to go! Your smoothies will stayfresh for about two days. Alterations: I’m a big fan of arugula. However, if you’re not a fan of this peppery green you can substitute kale, spinach, or mixed greens for the arugula. Tip: want to give your smoothie a little extra health kick? Add 1 tablespoon ground flax seed.